Midway through March, I received a note from Rocky Mountain Icehouse. They had noticed that my previous review was a couple of years old and they decided to extend an invitation to me and a few friends. The meal — consisting of several plates from their revamped menu ─ would be complimentary. In turn, I’m now providing an update on my thoughts of their food. The first thing I’d like to note is that I’m not certain of when the menu was redone. I was simply told that it was new. Yet, I’d been there almost a year ago for a friend’s going away party and, from what I can recall, the options are pretty similar. Some identical selections were even discussed within my initial blog post back in 2014. Perhaps they’ve kept the most preferred and replaced the others with fresh picks. Although I’m not entirely positive of that, what I do think may have drastically changed are the recipes for a couple of the dishes I’ve either had or seen previously. Kelsey was the staff member who organized this tasting event for us and she also acted as our server that afternoon. Once everyone was settled in with their drinks, Kelsey began to bring the plates over to our table. All items were selected by the chef, so we were constantly being surprised throughout our time there. Our first offering was a Spinach and Garlic Dip with their house-made potato chips. I found this to be an interesting choice because the chip and dip combo seemed to be missing from the menu completely. The potato chips alone, however, are provided as a side to any of the sandwiches and they’re large, crisp and not overly greasy. Against the lighter dip, they held up well. I’m just not convinced they’d stay whole with a dip of a thicker consistency. Next up was the Mac & Cheese Hushpuppies, which turned out to be a favourite among the group. This starter consisted of six fritters made using a mix of pasta, corn and peppers. Deep fried and golden brown in colour, these were then drizzled with chipotle aioli. Cheesy with a bit of heat (both in temperature and taste), it meant that each of us jostled to get our fair share before they all disappeared. An order of the Steak Bites continued our foray into their appetizers. This dish was comprised of eight skewers of tenderloin tips wrapped in bacon. According to the description on the menu, these steak bites were to be served with a lemon tarragon dip. Even though I couldn’t quite distinguish those exact flavours, I did enjoy these immensely. The meat was cooked to a medium rare and was tender enough. We especially loved the bacon. Still crispy, we guessed that the bacon strips must have been cooked separately from the steak to ensure that both meats were prepared properly. Balsamic vinegar added a touch of acidity and sweetness. 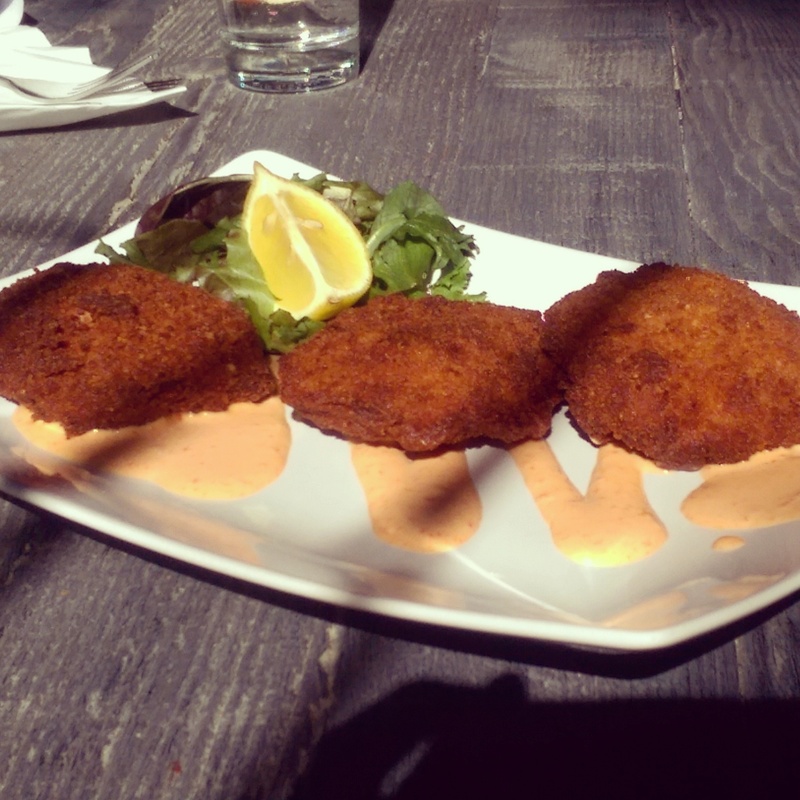 The round of starters finished with their Signature Crab Cakes. These two generous patties of shredded Alaskan crab claws mixed with Boursin, feta and cream cheese came out batter and fried with a decent helping of garlic aioli on top. The menu made mention of a roasted tomato sauce that was to accompany the cakes; save for a few halved grape tomatoes, there seemed to be nothing of the sort. We ladies leaned towards this appetizer as we appreciated the quantity and the mix of cheese. It was particularly appetizing with a spritz of lemon. I also liked the texture as I could tell that real crab meat had been utilized. My boyfriend was on the fence. Granted, he’s from the east coast where seafood comes straight from the ocean and nothing in landlocked Edmonton can truly compare. 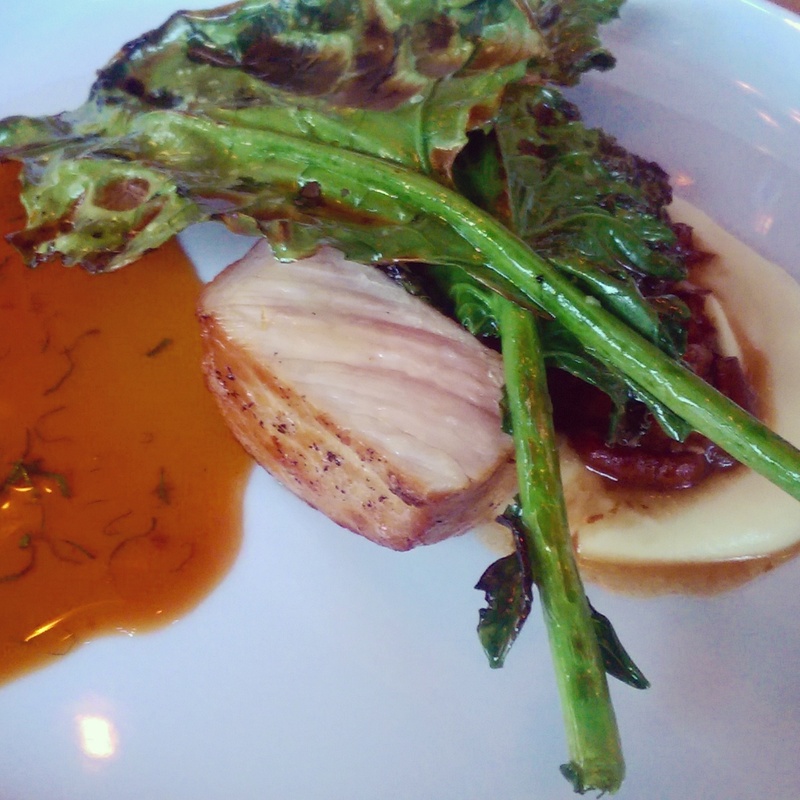 With barely any time to sit and digest, our first main dish showed up at the table. The BBQ Pork Ribs were a feast for the eyes and the belly. Just as described on the menu, this huge half rack of ribs was slow cooked until the meat fell right off the bone when touched. A knife wasn’t even necessary. The pork was succulent and the bourbon BBQ sauce was deliciously smoky and rich. Sides of garlic mashed potatoes, homemade baked beans and roasted seasonal vegetables ─ each delectable ─ were included as well. For less than $20, this was a superb value and something I’d definitely be sure to have on a return visit. Entree number two was the half size of the Jambalaya (only $12 and a huge portion for the price). This also came with a couple of the Mac & Cheese Hushpuppies. I’m not sure they were really necessary. Nevertheless, I suppose it’s a bonus as they are tasty. Otherwise, the jambalaya was a combination of rice, onions, peppers, chicken and spicy sausage sautéed in a southern sauce. My friend’s husband couldn’t get enough of it and managed to polish off what remained towards the end of the meal. Personally, I found it to be okay. While I was pleased with the consistency of the sausage and there was a good amount spice, which provided a bit of a kick, I couldn’t imagine eating the full plate as a main on my own. Because everything is cooked in the same sauce, I think it eventually becomes too much of a singular flavour. Sharing this dish helps to sidestep this issue by allowing for a smaller sampling among a handful of other offerings. The finale to our mains was the Blackened Bison Burger. I was actually astonished to bite into meat that was juicy and not dry as the latter is often found to be the case with bison. Despite the burger being made using a prefab patty, this was still pretty satisfying on my part. The combination of jalapeno jelly and jalapeno havarti cheese won me over. Additionally, as expressed by one of my dining companions, the bun also held its own; it was soft yet strong enough to keep the layers of the burger intact. The kitchen’s single misstep during our entire lunch was the Southern Gumbo. It can be ordered as an individual cup or bowl of soup or as an upgraded side for $3. The cup came with our burger and, disregarding my fullness, I felt an obligation to try it. Now, in my first review of Rocky Mountain Icehouse, I quickly referred to the gumbo since my friend had eaten it when we dined there together. From what I recall, it looked like a hearty broth with plenty of fillings. On this occasion, the soup was incredibly thick with a gravy-like mouthfeel and slices of Italian chorizo sausage that felt oddly dry and off-putting. Maybe it was meant to be that way. Maybe not. Regardless, it’s safe to say that it’s doubtful we’d to give that one another go. Last was the dessert. Kelsey let us choose between the two options available. Warm apple crumble called to me, but after Kelsey mentioned that it was the sweeter one, I changed my mind and we went with the Bailey’s Chocolate Ganache Pie. I expected this to be quite dense, yet it turned out to be slightly lighter, albeit a bit sticky. Overall, it was still sugary. What made it seem less so was the balance of bitterness from the chocolate and a tinge of tartness from the raspberries infused into the ganache. All in, this meal would have cost us approximately $110 plus tax and tip (drinks extra). That much food between five people is a total steal. Everyone left happy and no one left hungry. In fact, we ate as if we were royalty. Out of nine items, there was merely one that we disliked and those are decent statistics. As a local gathering place, Rocky Mountain Icehouse presents patrons with a great atmosphere and a casual menu that was created to please. A place setting at the table. It was in the winter of 2013 that I happened to be passing along 124 Street when I spotted a sign in the window of a darkened corner of the building at 102 Avenue. A cryptic “North 53 Coming Soon” piqued my interest. My immediate assumption was that it was going to be the home of a new restaurant, and I was right. Shortly after, I was reading the Edmonton Journal and there was an article in the Food section about a young chef named Ben Staley who would be heading up the kitchen at North 53 (@north_53) with owner Kevin Cam by his side. I was beyond excited to see that there was more new blood being woven into a neighbourhood that has had its mainstays throughout the years, but, recently, seems to be going through a revitalization of sorts. North 53 was just another step in that direction. 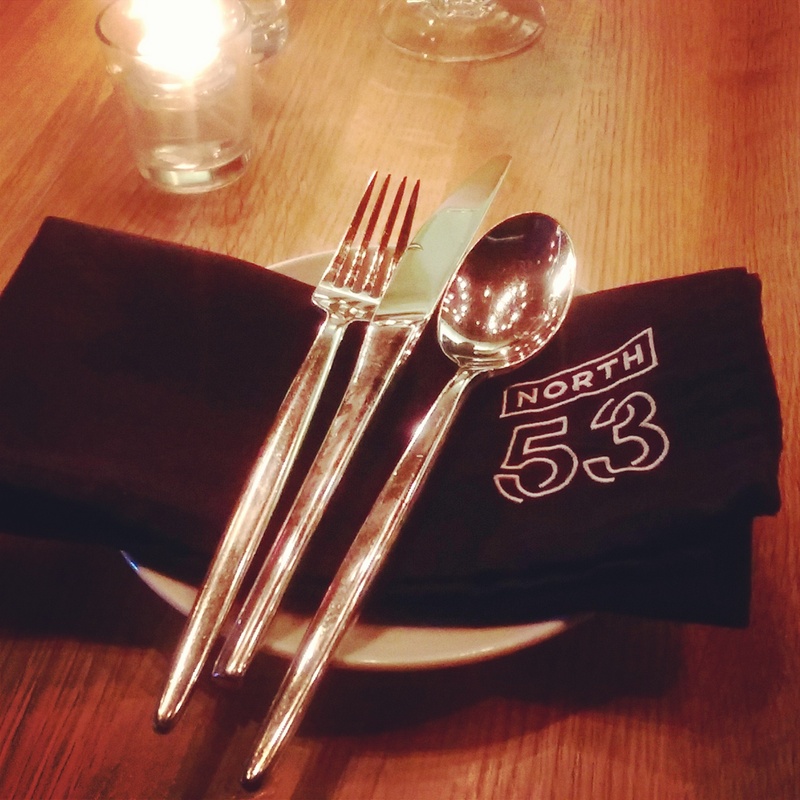 Finding it difficult to keep up with all the fantastic dining establishments that are popping up in Edmonton nowadays, I did not make it to North 53 when they opened this past January. In fact, it took about nine months before I set foot in the place. My friend and I decided that, before our scheduled book club meeting on a Friday evening in September, we would treat ourselves to a nice dinner. I was proactive and made a reservation for 5:30pm through their Yelp SeatMe system (very similar to OpenTable, but no points) found on their website. It usually isn’t an issue for us to be anywhere by that time after work; however, as it happened, my companion was stuck at the office later than expected. Thankfully, the staff at North 53 were accommodating when I phoned to see if we could shift our reservation back a little bit. A peek at the entrance from inside the restaurant. The original interior of the restaurant – lots of mirrored surfaces. Finally, about an hour after our originally planned dinner time, we made it to the restaurant with a few minutes to spare. The neon sign our beacon in the rain, we walked into the small doorway where patrons are greeted with a canvas of graffiti art that paints the establishment as cool. The tables were not full yet, so we were seated immediately. The room is long and narrow with maybe a dozen tables in front of the floor to ceiling windows that span the entire length of the space. Across from the tables is a fairly long bar that is decorated with light woods, grey tiles, and chrome chairs and shelves as well as mirrors that serve to make the eatery look larger than it actually is. The tiled ceiling is black with statement desk lamp chandeliers. The design is sleek and modern with a twist, which goes along well with what I think they hoped to accomplish in regards to their food. Flaming cocktails that were made at your table – this was for a neighbour. The sodas from our first visit. In a way, the sparseness in the aesthetics of the restaurant is a continuation of what looks to be a simplicity in the dishes they prepare, but that’s far from the case. The two of us were presented with two menus – drinks and food. They had a number of specialty cocktails, a couple of non-alcoholic beverages (tea and soda not included), some beers/ciders and wines listed. We opted for the mocktails, which were housemade lemonade and ginger soda. There was a bit of a mix up when they arrived at the table; I received my friend’s ginger beer and she my lemonade. It was only because we tasted each other’s drinks that we figured it out even though hers was clearly gingery with a tad of citrus thrown in for good measure. Both were pleasantly refreshing and my lemonade was just what I needed. With regards to the food menu, they had two. You could opt to sit through a multi-course meal for about $100 per person, or you could go the à la carte route. Since we arrived to dinner later than we had intended and our friend would be waiting for us in less than two hours, we figured we didn’t have the luxury of indulging in the tasting menu. It sounded absolutely fabulous though. Watching another table enjoy it made it all the more tempting. Instead, we decided to share four plates from their regular menu, including the Cream of Broccoli Soup, the New Season’s Potatoes & Carrots, the Pork Loin and the Sockeye Salmon. The Cream of Broccoli Soup was not the easiest choice to share, but it was definitely worth trying. The bowl arrived with a discus of fried cheese standing up out of a cloud of foam. In a separate carafe was the soup – a fine puree of broccoli and cream – which our server poured into the bowl, adding a beautiful, bright green colour. We crushed the cheese, so that it melted into the soup and dug in. The soup was incredibly smooth with the broccoli flavour playing off the cheese and onions wonderfully. Both of us said at the end that if we could have done our meal over again, we would have each ordered our own bowl of soup because sharing wasn’t enough. The Potatoes & Carrots were cooked very nicely, and this is coming from someone who doesn’t usually love carrots. I enjoyed it. Although, I’m not sure that it would have been a top choice for me in the future. When, what I’m going to call the mains, arrived at the table, we chose to each eat half of one and then swap plates. I started with the Pork Loin. Quite honestly, the pork seemed just a tad overcooked. I know it’s a hard meat to ensure that it is not only tender, but also cooked all the way through. It was not pink at all, so that’s good, but there was definitely more chew than I would have preferred. That was offset, though, by the accompaniments of steel cut oats, endive and stinging nettle. The oats looked like they were pureed into a velvety concoction, sort of like a side of mashed potatoes, but better. The endive added a sweet, nutty flavour and the stinging nettle a spinach-like taste. This was all topped off with two pieces of, likely, pan-fried or roasted kale (I’m guessing at the greens). Once I finished my half of the pork loin, we switched, and I took my turn at sampling the Sockeye Salmon. Out of the two dishes, I would say that this one came out on top. The salmon was perfectly prepared and the skin, which was left on the fish, was superb. I don’t usually eat salmon skin because it’s often cooked to a soggy mess, but this was so crispy and delicious that you had to have every bite. 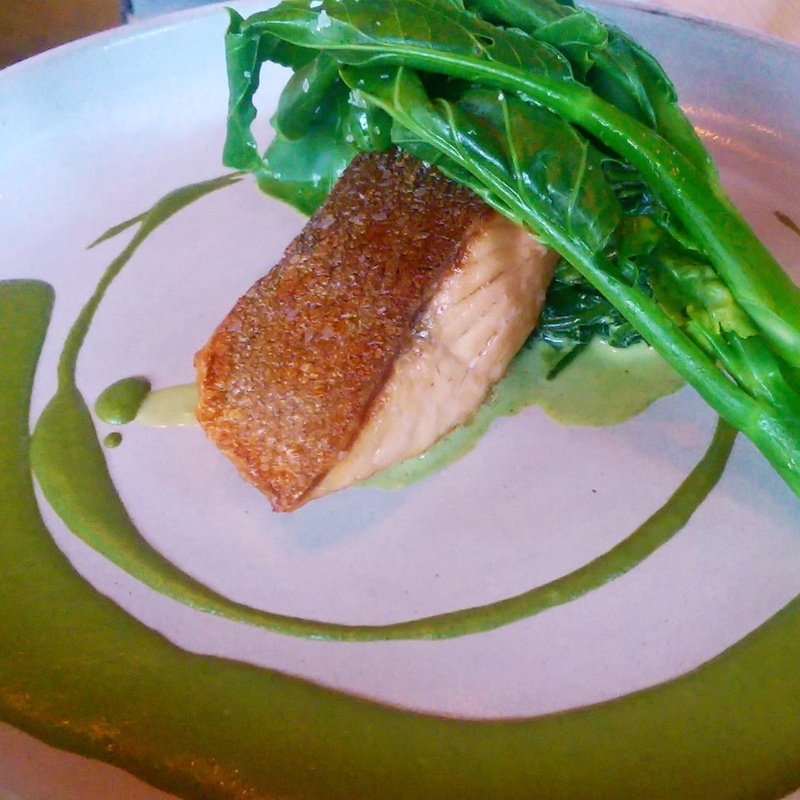 The fish was served with mustard greens, snap pea and guy lan. The evening was memorable and we definitely wanted to go back for that multi-course meal. However, shortly after that first visit, it was announced that chef Ben Staley was leaving the restaurant to open his own place called The Alder Room (likely set to open by spring 2015). With that huge change, owner Kevin Cam hired on Filliep Lament as Staley’s replacement. He has created a new menu that consists of smaller bites to help cater to the late night crowd that they hope to attract with their introduction of late night hours. With that move, they have also done away with the tasting menu option. These modifications seem drastic, but I understand that with the entry of a new head chef, it means they have the opportunity to experiment with their offerings and their clientele. The new food menu, introduced November 2014. The new drink menu – pre-designed cocktails and customizable concoctions. Because of all of these alterations, I didn’t feel it was right to review the restaurant solely on the visit I spoke of above. I needed to go back to North 53 to experience the eatery in its current state. So, I gathered a couple of my friends for a night out on a cold December evening. We arrived before 6pm and, while a few tables were occupied, it wasn’t full. We started off perusing the drink menu where they already have a number of signature alcoholic and non-alcoholic cocktails available. Of course, you also have the option to spin the wheel, allowing the bartenders to tailor a custom cocktail to your tastes by selecting a spirit base and flavour of your choice. Ultimately, two of us decided to order the Siberian Pineapple Express, which was sans alcohol, but quite flavourful. My only qualm is that the bartender prepared just one drink first, and, although we were told the second would be there in just a few minutes, I think it actually took at least 20 minutes, arriving after a drink that was ordered much later. Perhaps the bartender was slow or unorganized or forgot or missing ingredients, but that was not very acceptable. The third in our party asked for a suggestion from our server who pointed out the Rosey Cheeks cocktail. According to the menu, it is inspired by Persian ice cream and is made with a mix of Nigori Sake, lemon, saffron, cardamom, rose syrup, egg white and topped with tiny little rose petals. My friend said it was delicious even though she usually doesn’t tend to order sweeter drinks. It was also quite beautiful with a nice froth from the egg whites and the dark red petals adorning the cream-coloured foam. When it comes to the food, the menu is quite small, but it’s split up into the following categories: snacks, plates (small), large plates and dessert. All items are technically meant to be shared tapas style. One friend was on a vegetarian diet when we dined, so, while there were dishes she could eat, her options were limited to bar nuts, a couple of salads, sunchoke soup (bacon was listed with this, so I’m assuming they just don’t add it in if you can’t eat it) and desserts. 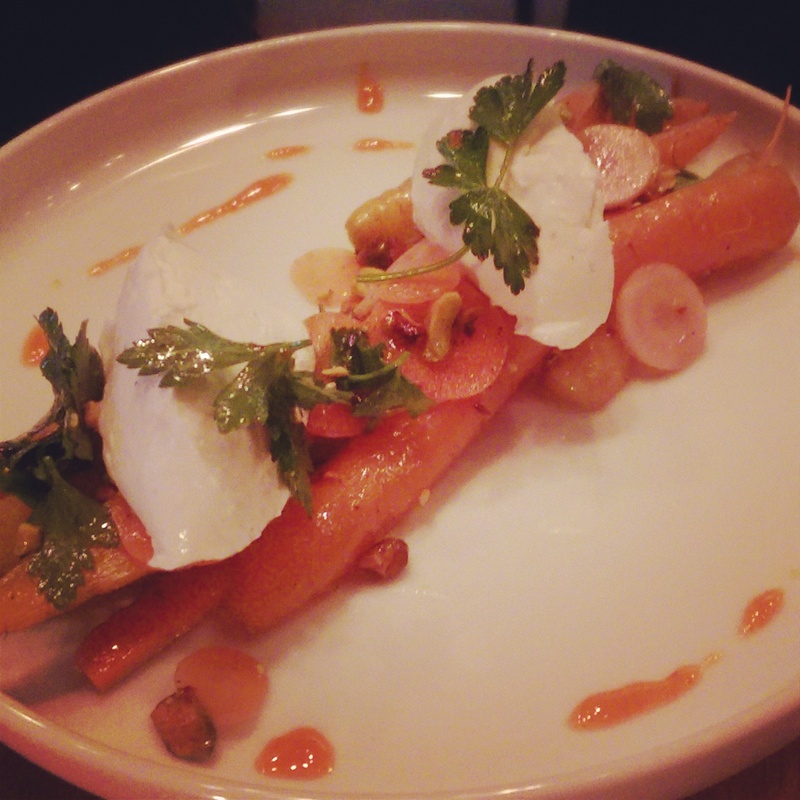 Since she couldn’t eat much else, she decided to go with the Carrot Salad. Made with green cardamom, goat cheese and pistachio, I had one bite and found the dish to be extremely refreshing on the palate. As for the two of us who are currently carnivores, we opted to share several plates, including the Griddled Mushroom, Popcorn Chicken, Rutabaga & Oxtail Tart and Beer-Glazed Short Rib for dinner as well as the Apple Tart and Pouding Chômeur (“poor man’s pudding”) for dessert. The Griddled Mushroom is served with a poached egg. I sampled a mushroom before we broke the egg and it had a distinctly Asian sort of flavour, reminiscent of Chinese dishes I’ve had in the past. Once we popped the egg with a toothpick, the yolk just melted into the sauce that was already on the plate, creating a thicker base and a smooth consistency. The Popcorn Chicken was our second selection off the snack section of the menu. Arriving to the table in a cute bowl that looked like it was filled with chicken nuggets covered in Parmesan cheese, these turned out to be slightly elevated versions of the fast food classic. The whole meat pieces were lightly breaded and succulent. The shavings on top were not cheese, but actually popcorn. I personally think the flavour of the popcorn is lost when eaten with the meat, but I put a bit of the popcorn on my tongue and the buttery taste was unmistakable. This dish is a fun idea, but maybe it could be better executed to fully take advantage of the popcorn and chicken combination. 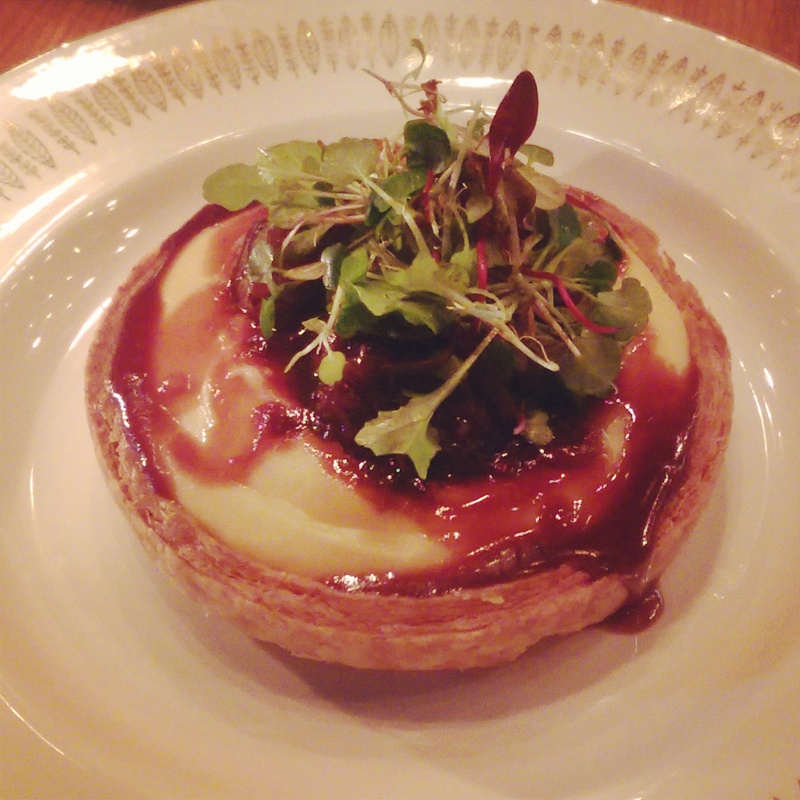 The Rutabaga & Oxtail Tart and Beer-Glazed Short Rib acted as our main course. The tart had a lovely flaky pastry base that was stable enough to hold the pureed rutabaga filling. The oxtail was cooked until it was fall apart tender. Topped with a salad of herbs, this dish had a great earthy flavour from the rutabaga, wonderful complementary textures and a nice herbaceousness that balanced well with what seemed like oxtail with lingering hints of booze from the cooking process (again, I’m guessing here). Lastly, we had the short ribs. For a “small” plate, the portion size was massive. 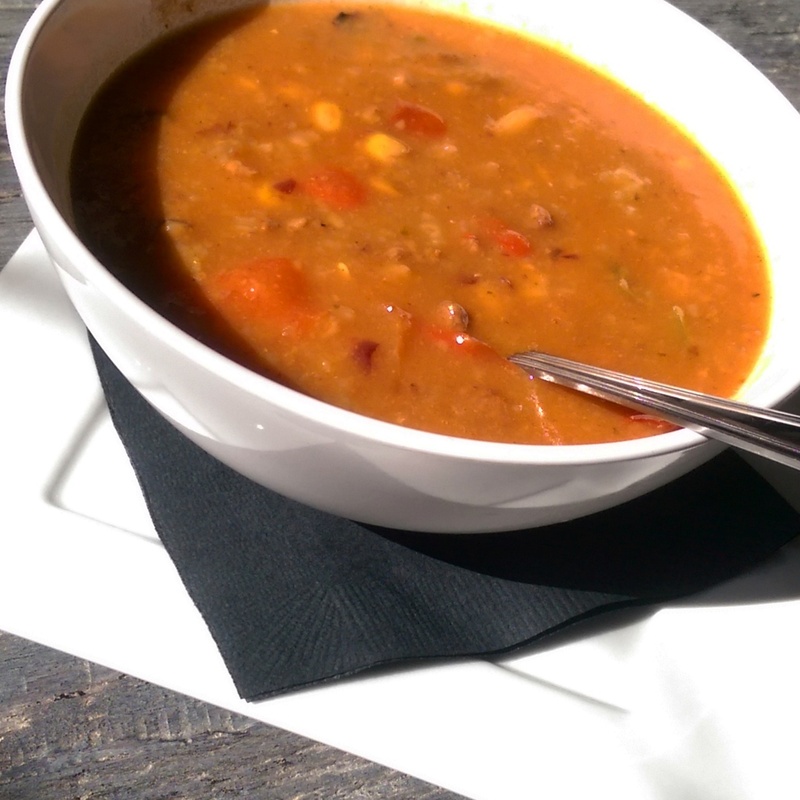 Served in a circular plate-bowl, the bottom was covered with navy beans, diced celery and carrots and bone marrow. Placed on top were two huge pieces of short rib still on the bone. We split each piece in half, and started working away. The short rib was quite good, but I would say that the slightly smaller of the two cuts of meat was overcooked a little. I also think that the ratio of beef to the accompaniments could have been better. It was just too much meat and not enough in the vegetable or legume department, and the overall flavour of this particular dish was lacking compared to everything else that evening, or, perhaps not lacking, but too one-noted after a couple dozen bites. I had also never tried bone marrow before, so I wasn’t sure what to expect in that regard. In my head, I pictured some sort of puree-like addition to the plate, but I think the marrow was, in fact, the fattier pieces found mixed in with the beans. 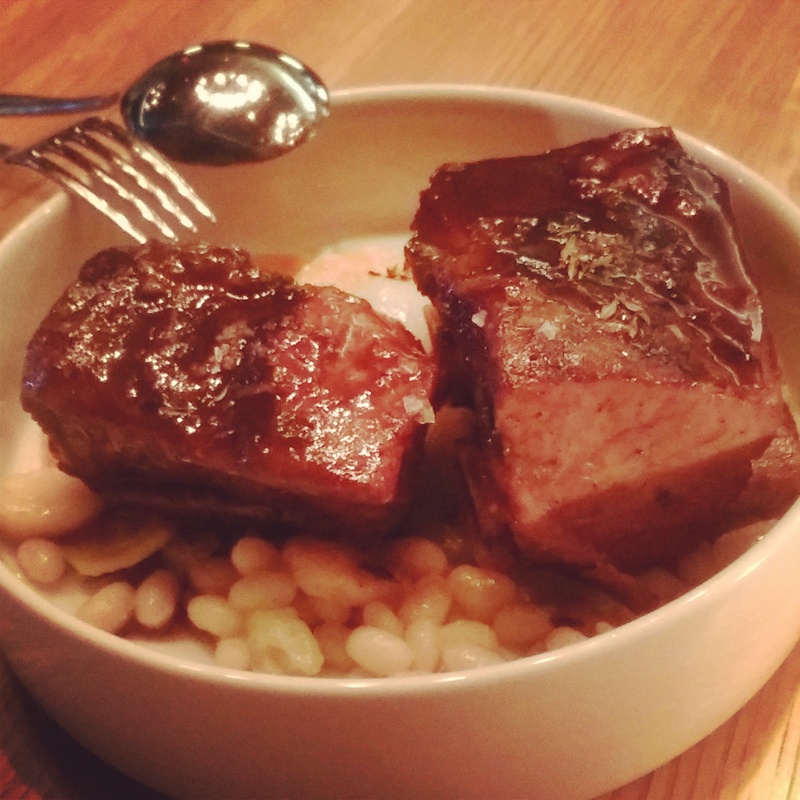 It was an interesting addition, maybe a way to compensate for the short rib’s own lack of fattiness. I will say, however, that the short rib is a great value for the amount of food that you do get. If I ever were to try that one again, I would be sure to have more people to share it with as it was too much for just the two of us. If you assumed we were finished after all of that food, you were wrong. There was no way we were leaving without trying some of the desserts this time around. At first, we were only going to order the Apple Tart, but the special for the evening, Pouding Chômeur, sounded too good to pass up. The dessert menu (and late night eats). I know that an apple tart seems like a pretty generic dessert. Many restaurants have something similar on their menus, but this one was unique in that it kind of pulled from the idea of a baked brie pastry, pairing tart apples with ice cream and a salty-sweet base of cheddar shortbread. I loved that you could taste each layer and that the cheddar actually came through. Traditionally, Pouding Chômeur is made with the cake batter rising above a layer of caramel or syrup as it bakes, but at North 53 it was like a reverse Pouding Chômeur because the liquid remained at the top. My guess is this is due to their use of a dense shortbread in lieu of cake. The result was a piping hot, rich dessert with a dark chocolate center that helped to offset the sticky and sugary caramel topping. It was absolutely delicious, but probably best in smaller doses. Personally, my feelings of North 53 are mixed. I think the eatery is still going through growing pains. I also really believe that they would benefit from increasing the size of their menu to include a few more vegetarian dishes that can be eaten as a main dish if someone wanted to choose a singular plate as their meal and not leave hungry. That being said, based on my two outings, I can see why North 53 was shortlisted for Enroute Magazine’s list of Canada’s Best New Restaurants for 2014 (of the two Edmonton restaurants vying for a spot, RGE RD was chosen in the end). The slightly altered decor, which now gives the place a moodier vibe. The establishment has great potential, but they have to find the right footing by figuring out what their signature dishes should be and branching out from there. They also need to improve on the consistency of their service. With all that in mind, they’re definitely not a write-off. I appreciate the space, which now has a darker appeal with all the chairs painted black as opposed to mirror-like silver, yet aims for a bit of that vintage, homey vibe with the use of mismatched antique dishes (these are the only two changes to the aesthetics that I could discern). 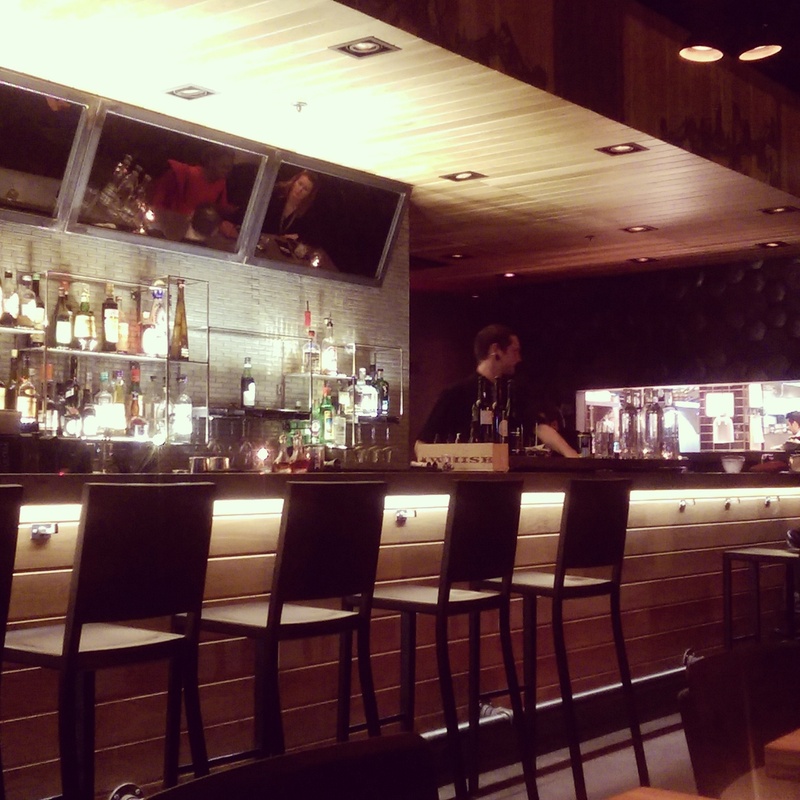 North 53 is a cool, casual hangout for Edmonton’s in-the-know crowd who want a place to go for late night snacks, good cocktails and conversation. For a more in-depth look at this establishment, visit The Local Good to read my profile of North 53. Bottles stacked on open shelves create a wall that partitions the space. 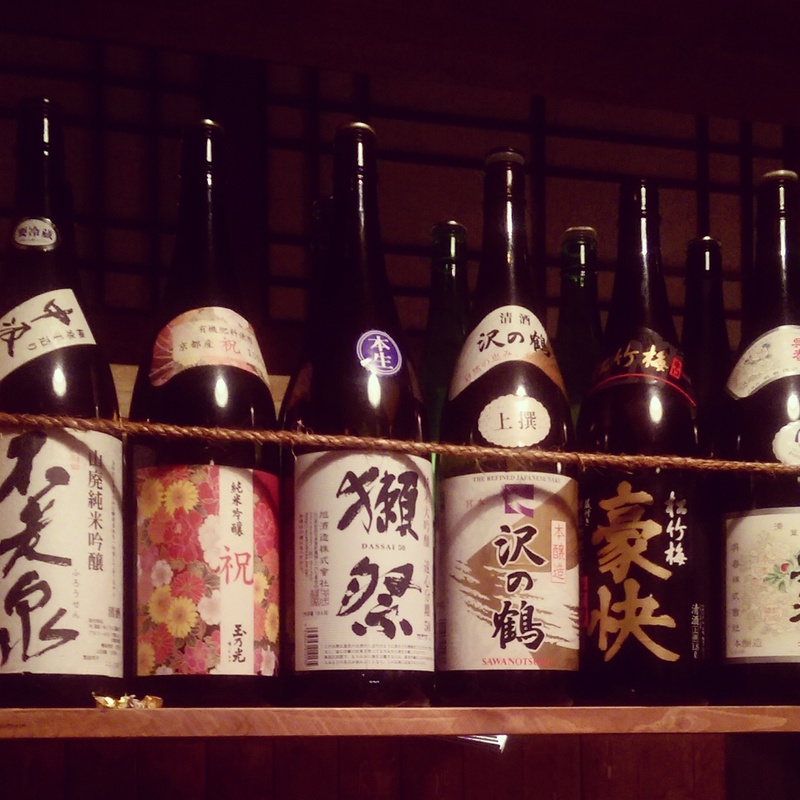 Early in 2013, I started to hear about Izakaya Tomo (@IzakayaTomo780). I was excited to see that a Japanese tapas bar was being opened in the city, the first of its kind here. Having been to Guu in both Vancouver and Toronto, I had an idea of what this new establishment was striving for, and equally high hopes. Of course, it took me almost two years to make it there. Situated on 99 Street and 37 Avenue in a strip mall, it’s a far cry from Edmonton’s more popular areas. Whyte Avenue, downtown, 124 Street it is not. But, after a long drive to the south side of the city, our group wandered into the natural and minimalist venue that is very reminiscent of actual Japanese spaces where we were pleasantly greeted with a loud “irasshaimase.” Outfitted with just nine wooden tables and matching benches and a few seats at the bar, I can see that there is the possibility of a wait on busier evenings. 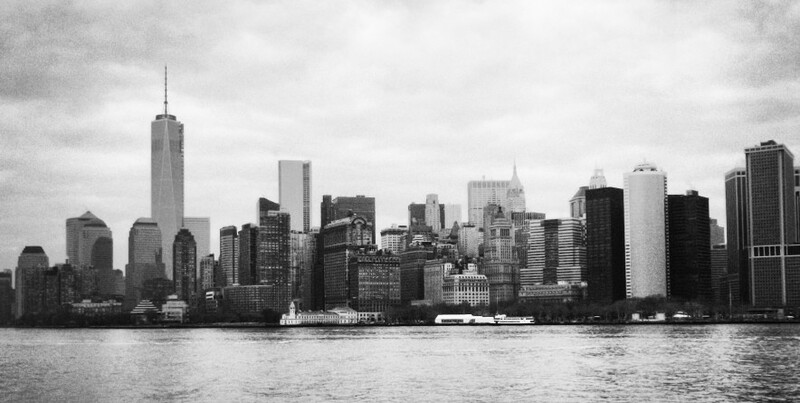 However, reservations are accepted, so if you are prone to planning ahead, give them a call. With a mix of traditional offerings as well as some dishes with fusion twists – the carbonara udon comes to mind – Izakaya Tomo has made a name for itself in Edmonton since it started welcoming patrons through its doors. The restaurant has racked up numerous accolades from the city’s many foodies who helped push it into The Tomato‘s 2014 list of 100 best things to eat in Edmonton, taking the No. 8 position. The minimalist look of the restaurant. The owner working behind the bar. Once we stripped off our bags and winter gear and deposited everything into the storage box next to our table, we got comfortable and began perusing the menus. To get the evening going, we ordered some drinks of which I selected a peach chu-hi (chūhai). I didn’t know what it was made of, but my friend recommended it. As it turns out, chu-hi is typically made with shōchū, a distilled alcoholic beverage, combined with carbonated water and juice. Apparently, some variants may use vodka instead, and canned chu-hi can sometimes have a lot more alcohol content than those prepared at bars and restaurants. I’m not sure if the glass I was given came from a can or not, but it seemed like the amount of alcohol was small. Other drinks on the menu included beer, sake, shōchū, cocktails and non-alcoholic beverages. As we sipped on our drinks, we selected eleven dishes from the plentiful menu to share between us. About half had been sampled by two of my dining companions when they had visited previously, so, of course, we took their word. The rest of the plates chosen were new for everyone. The first order that made it to the table was the last one picked on a whim. 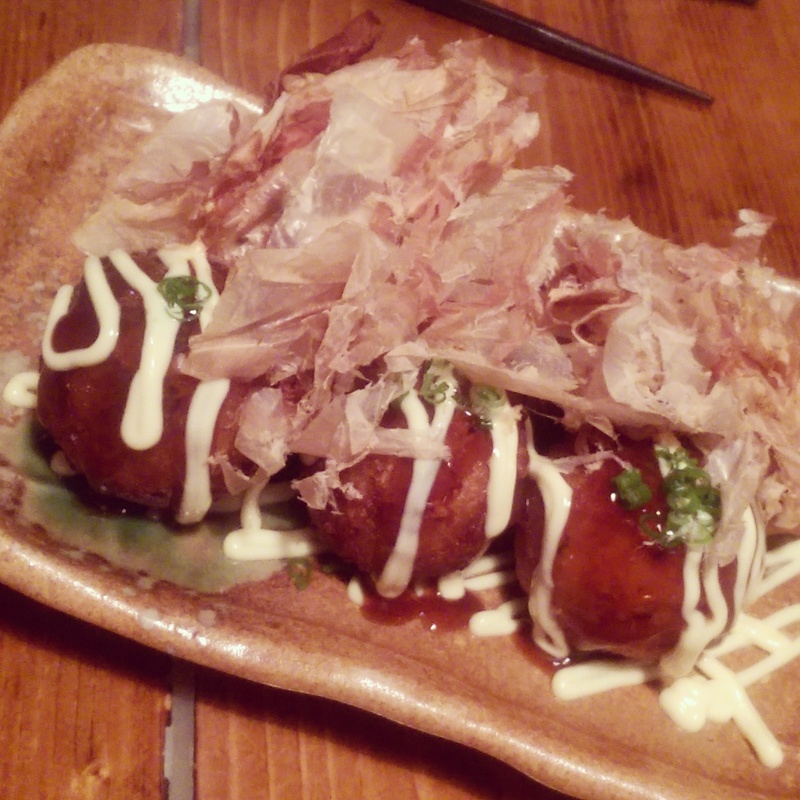 Crispy Tako Yaki, a battered ball filled with diced octopus and what tasted and felt like a starchy mix and then topped with takoyaki sauce (similar to mayo), aonori (dried green seaweed) and katsuobushi (dried, fermented and smoked bonito flakes). I remember having these at the night market on a trip to Vancouver several years ago and I can’t say I really enjoyed them then, but I quite liked them this time. The nicely battered ball broke away to a smooth potato-like center and pieces of octopus that had a bit of bite to them, but were not over cooked. The savory taste coming from the sauce, seaweed and bonito elevated the dish. After that, it was like a deluge, and we struggled to keep up with the succession of plates. The tako yaki was followed by the Tuna Tataki where I noted that the fish was very fresh. I know that any time fish is seared, there’s a risk of the meat becoming tough. This wasn’t necessarily the case here, but I did find that the texture of the raw fish wasn’t as smooth as I would have hoped or expected. Still, the simple flavours of the tataki were enjoyable. Around the same time, an order of the Nama Harumaki was dropped off at our table. Leafy greens, julienned vegetables, avocado and smoked salmon all wrapped up in rice paper and dipped in a soy and mayo based sauce, it was kind of like a really healthy order of maki. Although there wasn’t a whole lot to it, the rolls made for a refreshing palate cleanser. Next up was the Crispy Spicy Tuna Roll. My friend said the heat from the sauce was spicier than she remembered. However, I thought it was pretty mild. I do like a good amount of spice in the food I eat though, so I think it’s a matter of preference. The rolls were a good size – small enough that I could fit the whole thing in my mouth at once, but large enough that they had substance. The batter on the outside was light and not greasy. I’m certain that I could have polished off a second order. The rolls were proceeded by a couple servings of the Prawn Spring Roll. Raved about by my friends, the thin, crunchy shells were stuffed with prawns, avocado and cheese. The cheese, likely cream, was a surprising yet excellent addition to the spring roll. That ingredient, along with the avocado, created a wonderfully rich and velvety texture. Two kinds of Chicken Karaage were ordered: original and one finished off with a layer of mayo sauce. The original version is similar to KFC chicken in that it is marinated, coated in batter and fried. Paired with a light soy based dipping sauce, it arguably bests the fast food version. The second type of karaage was the same chicken, but cooked with mayo (I think it was spicy). A couple of us thought it was better than the original because the mayo provided an extra layer of flavour. Yet, as my friend pointed out, the mayo did take away some of the crunch that came with the original recipe. Again, this comes down to personal appetite. Aside from the two chicken karaages that we picked, there were, I believe, three other options available. To finish off our main meal, we had a bowl of Oyster Ponzu. Fresh, meaty, juicy oysters that are breaded, fried and served in a ponzu sauce with a squeeze of lemon, this was so delicious. Dinner was then capped off with an order of California Sesame Seed rolls. On par with other sushi places in Edmonton, these weren’t much to write home about. I would say that they did hit the spot though. We also had a bowl of Yaki Edamame. Salted and grilled so they were slightly charred, I think the method used to prepare them helped to infuse more flavour into the beans. All-in-all, it was quite a bit of food, but I definitely don’t think we overdid it. I think for a quartet, this was the perfect number of tapas plates. The favourites of the evening that will have me craving more from Izakaya Tomo are: Crispy Tako Yaki, Crispy Spicy Tuna Roll, Prawn Spring Roll and the Oyster Ponzu. I seem to like all the stuff that has been fried. Go figure! Each of us saved some room for dessert as well. One person went with the Vanilla Ice Cream with Koku-To Uneshu (brown sugar plum wine syrup). It looked like one of the lighter choices. Another ate the Caramalized Sweet Potatoes with Ice Cream. Waffling between that selection and the Matcha Ice Cream Sandwich, the latter wound up being my final decision. I was very happy with my selection because it gave me a bit of everything I wanted. The potent green tea ice cream sat inside a sandwich of two mini pancakes with cooked red beans on the side and soft, fluffy peanut flavoured mochi (Japanese rice cake). The food at Izakaya Tomo is prepared at lightning speeds, so you can get in and out quickly even if you order several items. This probably helps for turnaround of tables on nights when they have a full house. At the same time, while they don’t actually rush you out, the fact that the food is served so fast sort of means you don’t really linger as long as you might have wanted to. The whole point of an izakaya is to be a gathering place where people hang out for a whole evening. Even though that is what the establishment is aiming for, the small size of the restaurant and the impeccably prompt service almost create the opposite effect, which is a little ironic. Despite that, this place is great. Drinks included, we each paid about $40 to $45 for dinner, which when you take into account everything we packed away, I would say was worth the money. The staff are extremely friendly, and, if there are no people waiting for a table, I’d be inclined to spend the entire night with friends or family snacking on the food and imbibing the various beverages that are available. One of the walls when you enter the restaurant. Housed in the Jasper Block, built in 1909, and located on 105 Street and Jasper Avenue, Rocky Mountain Icehouse took the place of what used to be Fantasia Noodle House before that restaurant had to move in order to accommodate building renovations. Having ventured out on a walk during our coffee break on a sunny summer day, my co-workers and I stumbled upon the new eatery, and I made note that I would have to go back another time. In September, on a particularly gorgeous afternoon, I grabbed a friend for lunch and the two of us started wandering with no idea of where to go until the memory of Rocky Mountain Icehouse popped into my head. They have a small sidewalk patio situated just outside the doors, but we opted to sit inside by the front windows, so we’d get the sunshine as well as some air conditioning. I have to admit, I was a little skeptical of the establishment. For the longest time they didn’t even have a working website despite having been open for a couple of months (rest assured, they have one now and it’s quite nice), so it didn’t seem like the owners were all that organized. Regardless, I was willing to give it a try. One of the two entrances to the space. 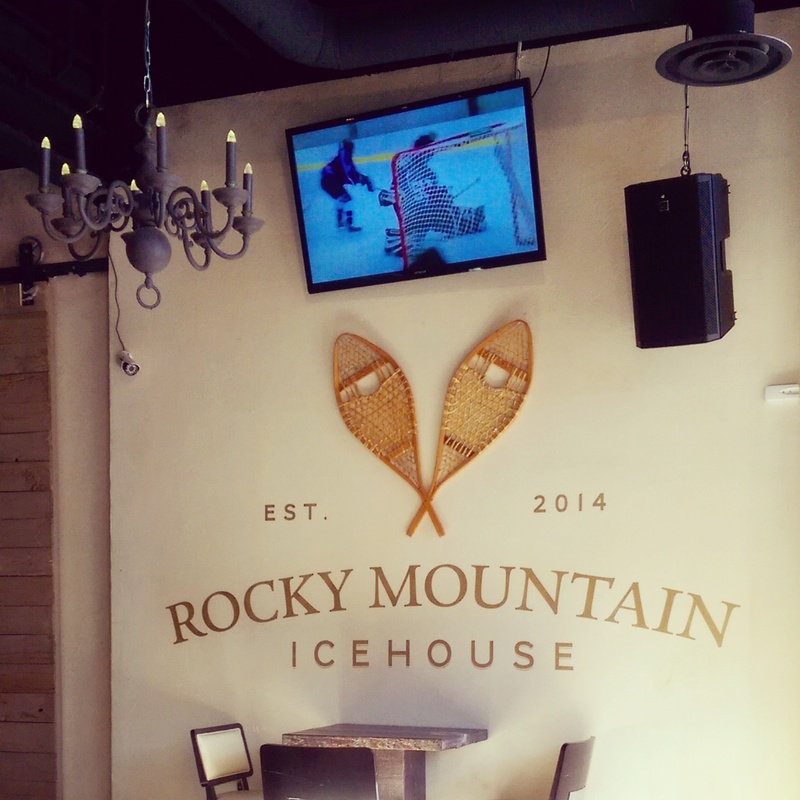 The large interior of Rocky Mountain Icehouse. The space is quite a bit larger than I expected. There’s even a large, private room called The Ski Lodge that can be used for smaller events or functions of up to 90 people. We were there for a later lunch, so I shouldn’t have been too surprised to see that only a few other tables were occupied. There was only one server on staff who indicated that we could seat ourselves wherever we wanted. She dropped off a couple of menus at our table and let us mull over the options. It’s a fairly succinct list of appetizers, soups, salads, sandwiches, dips, mains and dessert. The two of us opted to share an order of the Cajun Chicken Three Cheese Dip to start. My friend decided on a bowl of the Southern Gumbo as her entree and I went with the Crab Cakes. The Cream Cheese Tapenade that we didn’t order. The Cajun Chicken Three Cheese Dip that we did order. A plate of dip and warm pita bread arrived soon after we ordered. My first thought was that it tasted delicious, my second was that it wasn’t very spicy and my third was that I was impressed with how they managed to get something that was supposed to have chicken in it to such a smooth consistency. That’s when I thought I should check the photo I took of the menu, and we realized that we were given the wrong dip. Instead of the one we chose, our server brought us the Cream Cheese Tapenade – a blend of olives and cream cheese with a hint of spinach. Honestly, I was surprised at how much I was enjoying that dip before we figured out their mistake. I usually dislike olives with a passion (olive oil doesn’t count though), but I could barely taste them in this dip. I would have eaten the whole thing, but it wasn’t what we had wanted, so as soon as our server came back, I let her know, and she took it back to the kitchen and had a batch of the Cajun Chicken dip whipped up for us. Our second go round with dip was also tasty. This time, it was much chunkier with pieces of chicken breast, peppers, onions and jalapeno coming together with the cheese to pleasantly top off our soft slices of pita. Between the two dips, I’m not sure which I’d be more likely to eat again. I might actually be leaning more towards the tapenade, which is a slightly lighter dip. The cajun chicken dip can almost pass for a meal with the meat, cheese, veggies and starch…almost. Unfortunately, I did not sample the Southern Gumbo as my friend was battling a cold, but she was raving about it. The portion size looked quite large and was filled with chicken, chorizo sausage, peppers, onions, corn and rice. In particular, the sausage looked like it was housemade because, rather than the sliced cylinders of sausage often found in dishes, it was more irregular in shape, which made my friend think it wasn’t pre-prepared. If that truly is the case, I would be impressed. My order of crab cakes with aioli. My crab cakes were fairly run-of-the-mill. However, it’s not to say there was anything wrong with them. On the contrary, they were what I expected. Nicely breaded and crisp on the outside, there was a good crunch to them that gave way to a mixture of crab claw meat, boursin, feta and cream cheese. The crab cakes were then drizzled with roast tomato and garlic aioli, which helped to finish off the flavour profile of the dish. Come to think of it, I really should have squeezed some lemon juice on them to give it a better balance. I’m not sure why I didn’t do that. In any case, I did enjoy our meal there. It’s a great space with a welcoming atmosphere that, at least during a late lunch hour, is a quiet place to sit and chat. The food is sort of what you can find in any general pub, but they do an okay job with it (other reviews I’ve read have been mixed as well), and I hope that with time, as the restaurant builds on its identity, that it’ll continue to improve.